I fell in love with Happy Death Day (directed by Christopher Landon of Scouts Guide to the Zombie Apocalypse and Paranormal Activity: The Marked Ones) the moment I saw the trailer due to the glaring similarities between it and Groundhog Day. I loved that film due to the person stuck in time loop idea, and this is pretty much the same idea here, but with the added twist of each day ends for our heroine with her being murdered by the same mystery figure. Even that idea isn't wholly original as a similar concept occurred in Supernatural: Season 3 in the episode Mystery Spot where Sam was constantly reliving the same day in which his brother Dean was destined to die. Many story beats here are extremely similar to Groundhog day, so much so in fact that characters specifically mention that film (in a scene that was awkwardly implemented and kind of fourth wall breaking). It was fun they acknowledge the influence as this is very similar in style, except the slasher of course. As the same day repeats and repeats Tree starts to go a little crazy that is shown via a humorous montage, eventually she goes on a voyage of self improvement that culminates in one perfect day when she becomes who she needs to be for the various people she encounters. The way events happen is so familiar that this could really be seen as an unofficial sequel to that Bill Murray classic. Rothe is great in her role being able to bring a lot of fun to her character, her facial expressions in particular were always funny, whether it be from exasperation at finding herself in the same situation time and time again, or her knowing wink and nods to the various people she keeps bumping into. Yet when the time calls for it she can also come across as a determined heroine. Murder is obviously the biggest difference here and that is what feels the most fresh. I loved how no matter what Tree does she cannot escape the masked killer, the variety of ways she is killed lead to some great moments, such as when she is drowned she wakes up vomiting, when she is blown up she wakes up with flames briefly reflecting in her eyes, and when she is knocked down with a baseball bat her surroundings change into the dorm room with her landing on a bed rather than on the ground like she should have done. I liked how this morphed the body count of a traditional slasher film by transferring all the deaths onto the same character rather than many. The slasher's mask is suitably creepy, it was actually designed by the same guy who designed the iconic Scream mask. A novel idea was that while she is resurrected at the days start each time she is actually carrying over the injuries she has sustained in a fashion. Each day she gets weaker and weaker, even passing out one time and being taken to hospital where she is informed she should be dead due to the apparent problems inside her. Unfortunately with this cool idea it doesn't really lead to anything, this sub plot is abandoned halfway through Happy Death Day and never really mentioned again. With regards to just who is trying to kill her and for what reason when that is revealed it is pretty lame, but this fact isn't ignored by Tree who pretty much states as much. Either way it was pretty uninspired though I liked the red herrings along the way, and the way back story into her tragic past is slotted into background details. 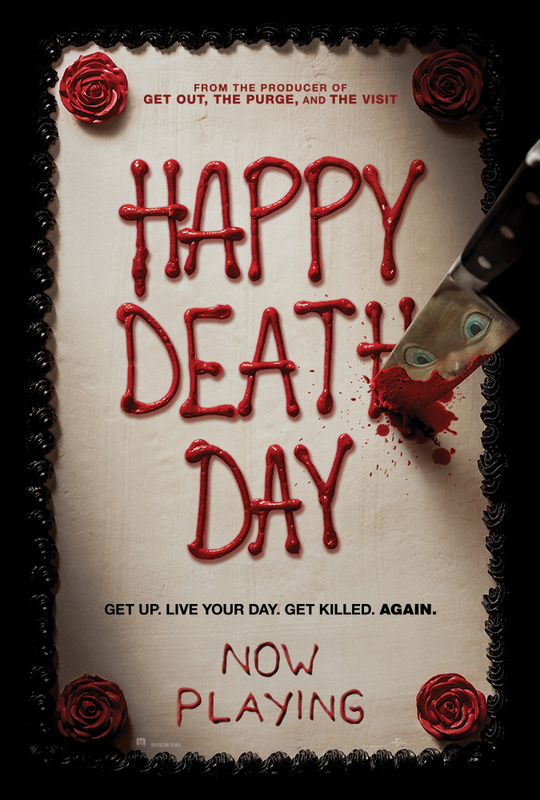 With a smart and often witty script, and a likeable main lead Happy Death Day is a fun little horror that never tries to be too seriously. The actual horror element may be a bit low for some but it was nice to have a twist on the usual teen slasher, and nice that the characters who mattered were not the usual super irritating ones that usually populate these type of films. Nearly an 8 from me, but the sometimes too familiar structure, and the too crisp and clean ending just about knocked it down to a very high 7.